Whether you are running your own business or are in charge of promoting a business online, Social Media is the place to be. As a Digital Marketing agency we are asked all the time ‘Why?’; businesses understand that marketing on Social Media is the done thing, but they want to know why they need be visible on social, and the answer is in the stats. If you are involved in a B2C business it is paramount that you are aware of the behaviour of Irish Consumers on Social Media. Digital Strategist Shane O’ Leary recently undertook some research into finding out how Irish people are behaving online and we have condescend it down to the figures that matter to you; the business owners, the social managers and the social media hobbyists. There are 2.4 million (87% of whom regularly log on via mobile) Irish people using Facebook each month, if that isn’t reason enough to adopt a tailored and tactical approach to your presence on Facebook, perhaps some of these stats are worth noting. The largest age demographic in Ireland is 25-34 year olds which makes up around 29% of the audience. 70% of Irish Businesses are on Facebook. So what does this mean to you? For starters it means Facebook provides one of the most readily available and accessible audience in Ireland with a varied demographic. If you are one of the 30% of Irish businesses who are not on Facebook you need to consider the opportunities you are missing out on. There are approximately 700, 000 people logging on to Twitter every day in Ireland. As a country we send 1 million tweets per day. 26% of Irish people over the age of 15 use Twitter. 92% of Irish Journalists use Twitter every day. While the number of daily users is significantly lower than that of Facebook the impact these users have is more notable. Facebook is considered a private space for most, while the majority of Twitter users are more comfortable with sharing opinions and interacting with brands. This is an important thing to be aware of for your brand as it gives you the opportunity to engage with consumers; personality injection is a must! It’s also interesting to note the number of Journalists using Twitter on daily basis. Many of these journalists are considered to be Social Media Influencers and could be worth building a relationship with; if they talk about your brand you are golden! 77% of Irish YouTube users access the site at least once a week. 1 in 3 people spend as much time watching YouTube as they do TV. 31% of Irish users view tutorial videos regularly. Of course there is more to social media than just those three sites, although we recommend you carefully consider your Audience before committing to the fringe social networks. 22% of the population has a Snapchat account and spends an average of 1 hour and 43 minutes using the app. We have a feeling this figure might have crept up given the sudden and huge increase in Irish Snapchat users in recent weeks. 24% of Irish people are on LinkedIn. 15% of the population is on Pinterest. 18% of Irish people use Instagram with 43% using it every day. 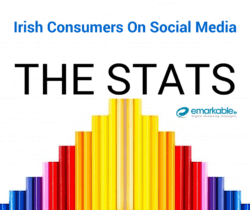 Almost 70% of Irish Social Media users follow brands and businesses on Social Media. This means that there are huge opportunities to connect with and learn about your audience. Source: Download Shane O’Leary’s Full Report Here.